I recently heard Jim Whalley (CEO, Nova Aerospace) give a keynote address at an awards ceremony and I was struck by some of his opening lines: “In real estate, it is about location, location, location. In business, it is about culture, culture, culture.” So what is culture exactly? It is also what is unspoken and what is “allowed to go through to the keeper”. In other words, culture can be explicit in the form of a set of company policies and values, but it can also be covert in terms of what is allowed to occur within the company. Incidentally, organisational culture is unique and distinctive for every organisation or company and is one of the hardest things to change. Culture is typically guided by the leader and the leadership group. As the saying goes, “the fish rots from the head”. Hence, the converse is true too. Authentic and genuine leadership promotes trust in a business and that has a trickle down effect throughout the organisation. But how does culture and strategy fit together? Well, fit together they do. Indeed both culture and strategy need to run in parallel, side by side. By viewing the diagram below, it is implicit here that both are absolutely critical to business success. No-one but Peter Drucker could have said it better, “Culture eats strategy for breakfast”. It is also important to recognise that culture alone is not enough to drive change, improve performance, increase job satisfaction or lift the level of commitment in an organisation. 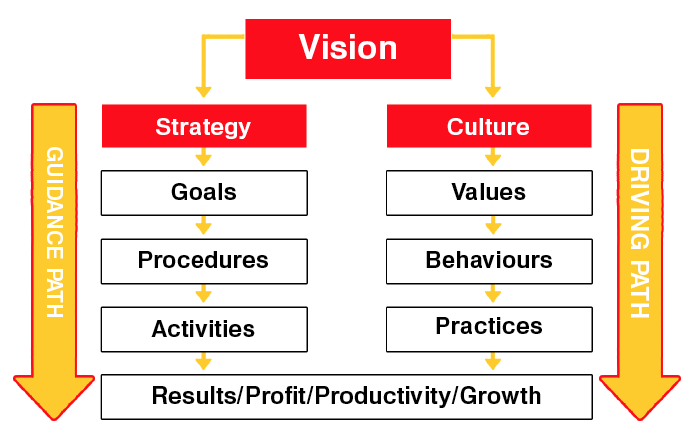 Culture needs to be managed in conjunction with a viable overall business strategy. Attention to culture therefore along with a sound business strategy allows the duality of these two facets to drive growth and profit. Sadly however, the reality is that in most organisations, most of the focus, energy and effort goes into strategy, processes, procedures and policies. In workshops that I conduct, participants will say that anywhere from 75% to 95% of their time, energy and effort goes into Strategy and Strategy Planning. Sadly, there is scant attention paid to culture and especially how to create a positive environment that allows individuals to thrive, be engaged and be empowered. Culture is often left in a sense, to fend for itself without anyone really driving to create a positive environment. It’s like trying to ride a one-wheel bike by just focusing on Strategy alone. Much easier to balance and drive the business riding on the two wheels of both Strategy and Culture together. Why make it hard? See Ravasi, D., Schultz, M. (2006). Responding to organisational identity threats: Exploring the role of organisational culture. Academy of Management Journal, 49 (3), 433-458. [See Schrodt, P (2002) The relationship between organisational identification and organisational culture: Employee perceptions of culture and identification in a retail sales organisation. Communications Studies, 53, 189-202). This proverb dates back to 1674, when it appeared in a treatise called “An Account of the Voyage to New England”. It is based on the fact that fish do begin to spoil at the head. As a figure of speech, it means that any problem in an ogranisation can be traced back to the boss.